The CO Sensor let you breath smooth. No matter if you have a chimney or another open fireplace in your house or use a gas heating or if you just want to do something for a better air quality in your home preventing headaches and discomfort - the CO sensor enhances safety and your living conditions at home reliable.The electrochemical carbon monoxide sensor by Popp is used for air quality monitoring and warns reliable if CO content in a room exceeds a defined limit. 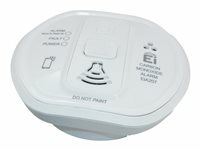 In case of an alarm the device causes a signal sound (85dB/3m) and reports the alarm as well as the current measuring value to the Z-Wave control center. The fix installed 10-year battery ensures a long lifecycle without battery change and thanks to the integrated Z-Wave module you can include the CO sensor to your home network and corresponding automations. The device owns a tamper protection, an easy-to-reach button for test and muting as well as LED signal lights for power supply, alarm mode and error reports. The additional memory function informs about previous CO alarms.Besides the factory-set alarm limits you can define own limit values to trigger for example smartphone notification which invites residents to open windows for room airing.